Gian Lorenzo Bernini (1598-1680) acquired great fame as a talented and skilled sculptor very early in his career. He initially worked as assistant to his father Pietro, a Florentine sculptor, on the decoration of Villa Borghese, but he soon received direct commissions from Cardinal Scipione Borghese. They included a marble bust of the cardinal (it opens in another window), the first of a long series which portrayed some of the key personages of Rome including the Popes. 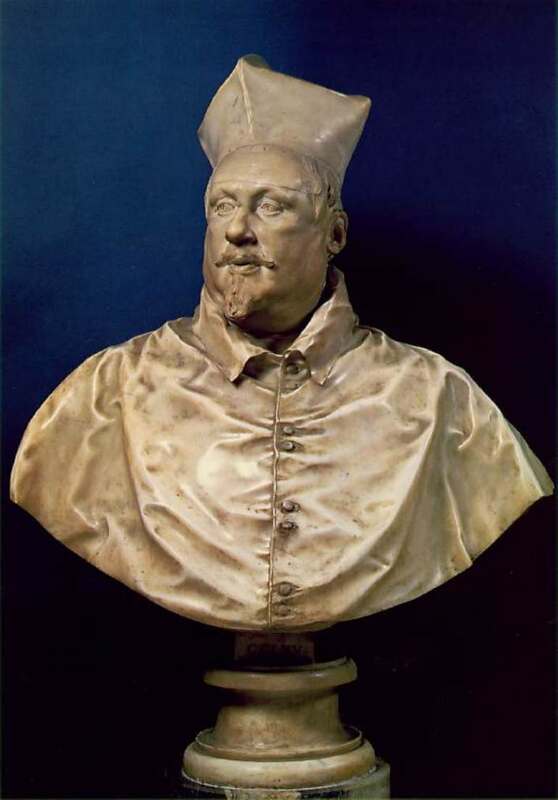 Pope Urban VIII commissioned him a bust of King Charles I of England as a gift to Henrietta Maria, the king's Catholic wife. 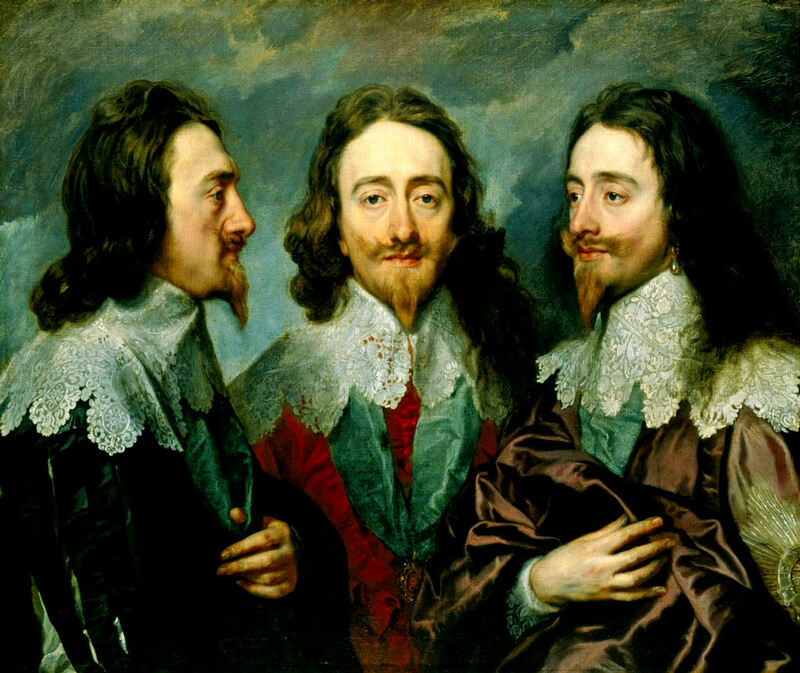 In order to allow Bernini to execute the bust, a triple portrait of Charles by Anthony Van Dyck (now at the Royal Collection - it opens in another window) was sent to Rome. A similar procedure was followed for the bust of Cardinal Richelieu, the very powerful Prime Minister of King Louis XIII of France. 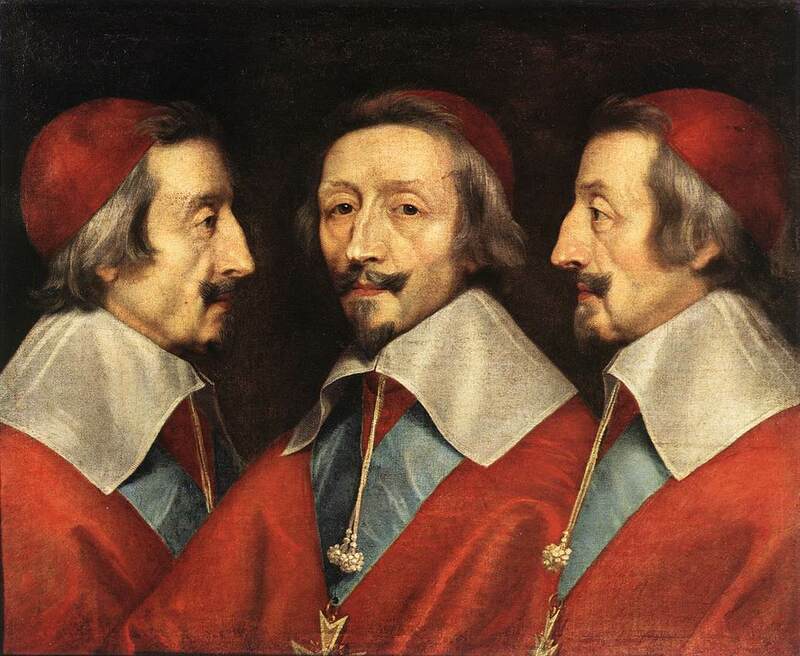 A triple portrait by Philippe de Champagne (now at the National Gallery of London - it opens in another window) was sent to Rome. 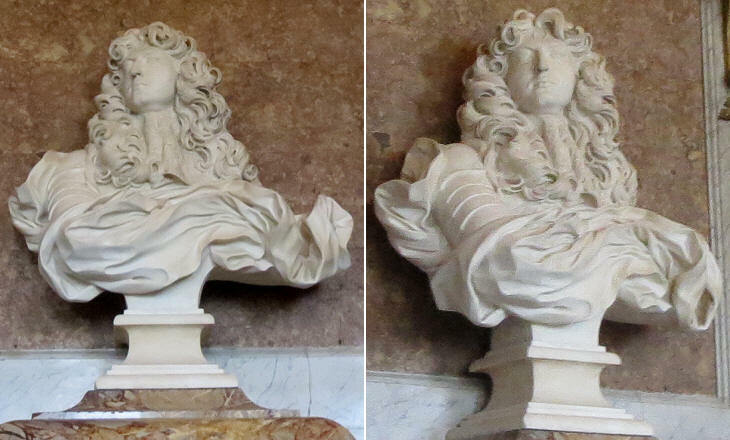 In the bust Bernini showed his mastering of marble in the thinness of the high collar and in the treatment of the hair. Bernini acquired fame as an architect at a later stage, although it was tarnished by the construction difficulties he encountered in building the left bell tower of S. Pietro, which he was obliged to pull down at his own expense in 1646. The construction of Piazza S. Pietro which began in 1657 gave new lustre to Bernini as an architect and in 1665 King Louis XIV invited him to Paris to discuss the redesign of the Louvre Palace, which the king wanted to turn into a majestic residence. The palace was a medieval castle which King Henry II of France had enlarged and funded its decoration. It had a square shape around a large unfinished courtyard. Catherine de Medici, Henry's widow continued the construction of the Louvre, but in 1564 she decided to build Palais des Tuileries, a new palace to the west of the Louvre with a large garden. The palace was used as a royal residence by many kings and eventually by Emperors Napoleon I and III. It was destroyed by a fire set in 1871 during the last days of the Paris Commune and it was never rebuilt. 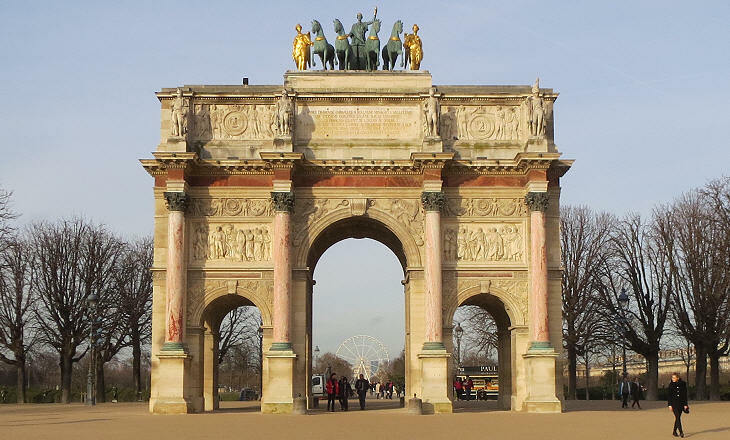 Its approximate location is marked by Arc du Carrousel, a triumphal arch resembling Arco di Costantino in Rome. In the XIIIth century the Popes built a corridor (Passetto) to reach the fortress of Castel Sant'Angelo from their palace in the Vatican. In 1565 Cosimo de Medici, Duke of Florence, commissioned Giorgio Vasari a direct passage between Palazzo Vecchio, the see of the government and Palazzo Pitti, where he resided. Similar passages which allowed rulers to seek refuge in a more secure location were built elsewhere in Italy as at Castiglion del Lago. 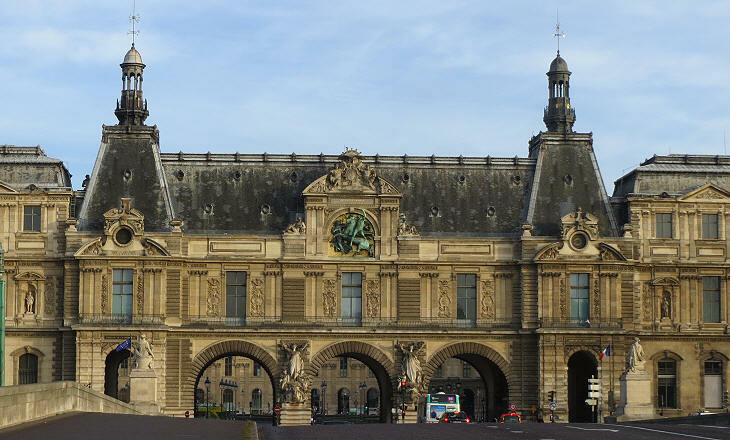 Catherine de Medici decided to link the Tuileries to the Louvre (which at the time was protected by a moat) by a covered passage, which was eventually replaced by a series of imposing buildings. Bernini was asked to redesign the whole Louvre-Tuileries complex: he sent two projects before going to Paris where he developed a third one; they all assumed the pulling down of existing buildings to make room for a new grand palace having its main entrance on the eastern side (towards Notre-Dame, the Cathedral of Paris). The matter was discussed at length with Jean-Baptiste Colbert who was at the same time responsible for the Bâtiments du Roi (King's Household) and Contrôleur Général des Finances. He was assisted by a staff of French architects; they criticized Bernini's projects by saying that the design of the interior of the palace was not functional and that the open loggias of the façade were unsuitable for the French climate. Colbert was afraid that the grand new palace would cost a fortune, however he eventually endorsed Bernini's third project and the first stone was laid with a ceremony before the architect left Paris. Upon his return to Rome Bernini learnt that construction of the new palace had been halted because of war expenses and eventually the project was abandoned. The long discussions with Bernini about the new palace had an influence on Louis le Vau, one of the French architects who most opposed Bernini. 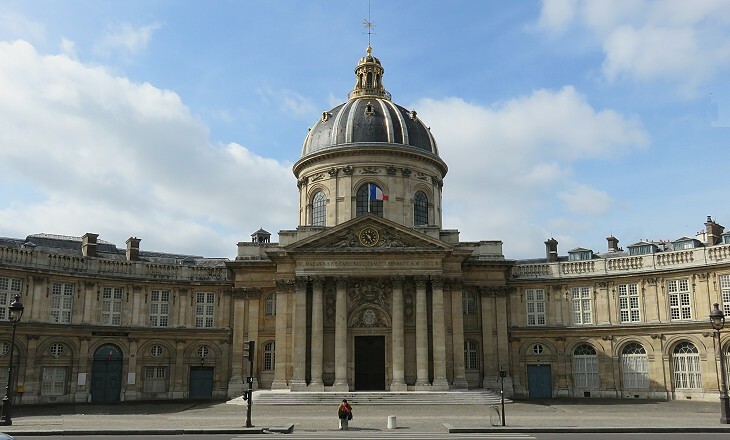 In the design of Collège des Quatre-Nations (today Institut de France), an institution founded by Cardinal Mazarin, he made the best attempt to reconcile French Classicism with Roman Baroque. 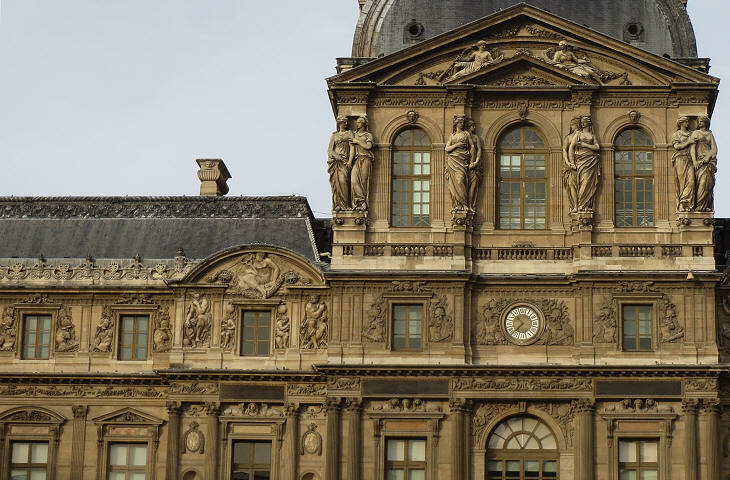 The concave façade of the building reflects a feature of Bernini's first project for the Louvre. 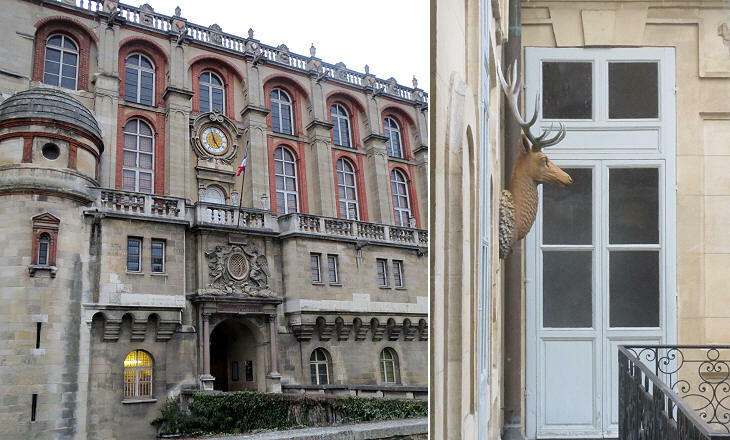 King Louis XIV was born in 1638 at Saint-Germain-en-Laye, a medieval castle surrounded by woods which Kings Francis I and Henry II had turned into a Renaissance palace. The kings of France enjoyed hunting and in 1624 King Louis XIII built a small hunting lodge at Versailles, some twenty miles away. In 1664 Louis XIV began to enlarge Versailles in order to host his guests during some spectacular parties. In the following years he gradually lost interest in the redesign of the Louvre and he focused on making Versailles his permanent residence. 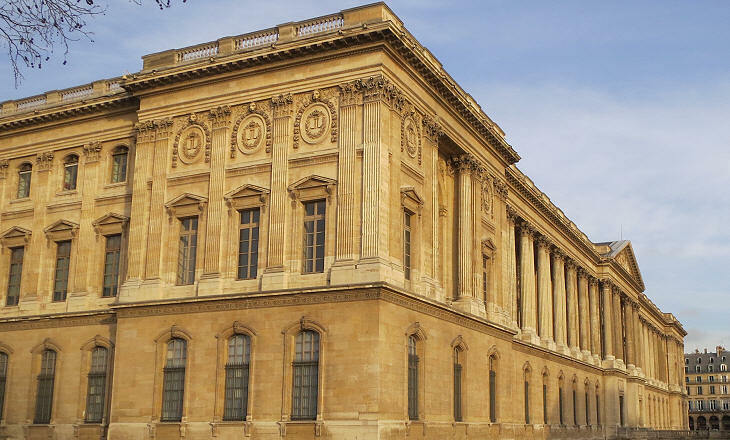 Eventually the Louvre was given a new external appearance which was designed by Claude Perrault; the eastern side is known as the Colonnade du Louvre and is regarded as a masterpiece of French Classicism. It influenced the design of many other buildings especially in the XIXth century (e.g. the wings of the United States Capitol in Washington), so that today it does look as if it had been designed in that century. 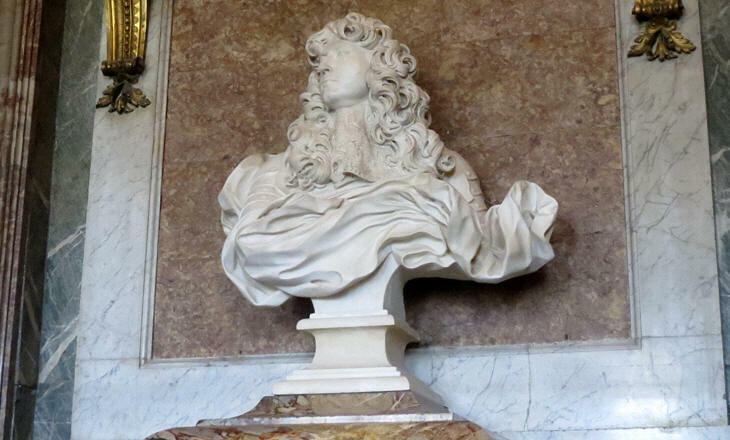 Although Bernini's journey to Paris was motivated by the design of the Louvre, he was asked by King Louis XIV to find time for a bust of himself. Bernini was prepared for this request because he was accompanied by Giulio Cartari, a young sculptor he trusted very much. Relations between the old artist and the young king were excellent and the latter gladly posed on several occasions during which Bernini made several sketches. 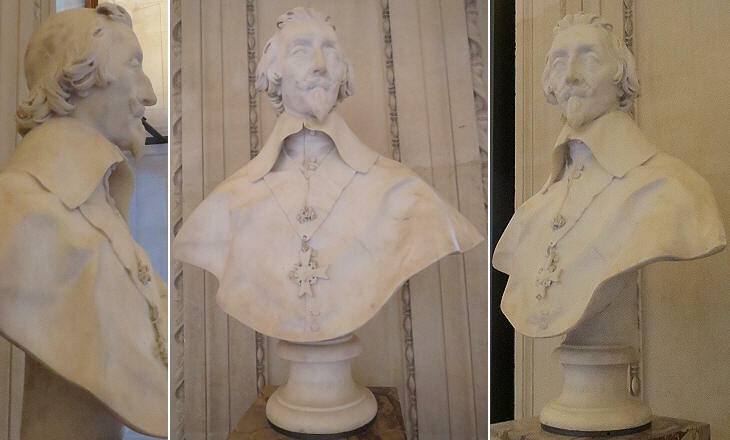 Bernini made recommendations for the bust being placed so that it would be seen slightly from below. King Louis XIV was pleased with his portrait and when he relocated to Versailles he placed it in a room of his apartment where it remains to this day. The king was portrayed wearing an armoury which is almost entirely hidden by an "animated" cloak, typical of many works of Bernini's maturity (e.g. St. Longinus). The cloak was used by Bernini to make the view of the bust more interesting from different angles and to underline the energy radiating from the portrayed person. You may wish to see a funerary bust by Alessandro Algardi, Bernini's rival, where the armoury and the cloak are treated in a very different manner.